In this article, we introduce the legal situation for the use of drones in Indonesia. In Indonesia, you are allowed to fly with your drone. We had no problems with our previous trips to Indonesia and were often allowed to film in palaces. But please keep in mind that temples and mosques are sacred places for the locals. That’s why you should show particular respect there and ask before a drone flight always on site if you can let start your Multicopter. Maximum flight altitude: In Indonesia applies a maximum flying height of 150 meters (= 500 feet). If you want to fly higher, you have to ask for permission at least 14 working days before the flight date. Maximum horizontal distance and FPV: Drone flights may only be performed within the pilot’s direct range of sight. Compulsory insurance: To my knowledge, there is currently no obligation to buy an aviation liability insurance for your drone. Nevertheless, we strongly recommend this! Maximum take-off weight (MTOW): Drones must not weigh more than 7 kilograms. Distance to airports: Flights are only permitted in uncontrolled airspace. Airport runways must be 15 kilometers away from drone operations. Other safe distances: You should not fly over crowds and should keep away from built-up areas. The distance to clouds must be at least 150 meters (vertical) or 600 meters (horizontal). Flight bans: Prohibited areas or restricted areas, drones with cameras must maintain a distance of 500 meters or more. Flight approval: No special restrictions are known. 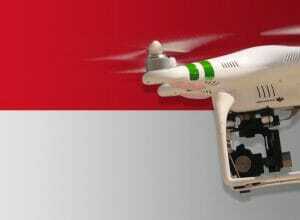 Time of operations: Drones are allowed to rise in Indonesia only when the sun is visible. The law forbids flights at night and in poor weather conditions. The visibility must be at least 4.8 kilometers. Specific regulations: You should note that your drone may approach the land border to a maximum of 500 meters if it is equipped with a camera. It is prohibited to drive drones from a moving vehicle, with vessels (boats, ships) excluded from this prohibition. Regulations for commercial pilots: We have no information yet. Please contact the Indonesian Civil Aeronautics Board for further details. Good to know: If you do not comply with the regulations, you are threatened with up to three years of imprisonment and a penalty of more than 66.000 euros. We have researched the listed drone regulations for Indonesia to the best of our knowledge. We can not guarantee the correctness of the information. If you want to be on the safe side, please contact the competent aviation authority. Alternatively, you can also ask the embassy in your country for further information about the regulations. Please leave us a comment when you receive news and/or gain experience with your copter in Indonesia! I would like to get information on how to rent drones in Indonesia, Philippines and Thailand. I am looking for a Phantom 3 or 4? It would be great if you could help me out on this! Hey Francis, cool article. We also wrote one recently that sums up Indonesian laws for flying a drone as well as airline regulations and best practices for flying WITH a drone = bringing a drone in Indonesia on a plane. Does that mean that the beach may not be filmed, or rather real borders like with Malaysia, East Timor and Papua New Guinea?